Jean-Luc Godard’s first feature, Breathless starts as the director meant to go on. With an effortless Gallic cool, Jean-Paul Belmondo, a Gauloises dangling from his lip, hot-wires an American car and accelerates off at high speed. He breaks rules and dances to his own tune all over town, and that is precisely was in turn to prove the director’s own intention. 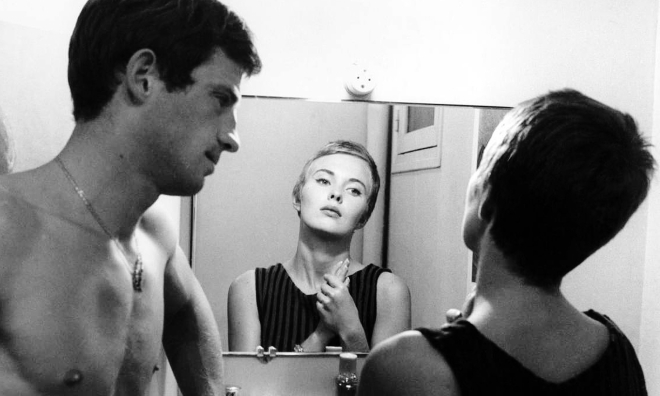 For the last five decades, Godard has explored the ever more esoteric modes of celluloid expression, but with 1960’s eye-catching debut – Breathless was the film that arguably defined La Nouvelle Vague – he kicked off a run of his most celebrated, accessible work. Those early years form the basis of StudioCanal’s new Essential Blu-ray Collection. As either an impressive primer for Godard’s expansive oeuvre, or as sumptuously rendered high-definition upgrades for fans, this collection undoubtedly fits the bill. From the jazz pulp of Breathless, it jump cuts to his initial foray into colour, Une Femme Est Une Femme, before expanding into the miraculous CinemaScope of the classical Le Mépris, plunging back into ostensibly familiar territory with Pierrot Le Fou before rounding off with the surreal science fiction poetry of 1965’s Alphaville. That this selection is far from an exhaustive retrospective even of his early “cinematic” period – widely considered to culminate in 1967’s Weekend – is a testament to his whirlwind productivity. It does manage to keenly capture the spirit of those years, however, illustrating the breadth and audacity of his style. The last of the big Cahiers du Cinéma critics to begin his own directorial career, Godard was always interested in interrogating the formal and storytelling conventions of his beloved medium. In the intervening years he has shifted further from traditional narrative but early on his films played with it – and the audience’s expectations of it – with the mild disdain of a genius child given a bucket and spade on the beach. Godard was never going to build plain old sandcastles like the other kids; the result is intellectually stimulation and invigorating, but not for everyone. Godard has never been interested in pandering to a passive audience – he provokes in search of active participation. This can sometimes make his films considerably easier to admire than they are to enjoy, but the fact of this range of responses is just one of the aspects that make his work so endlessly fascinating. In Breathless he picks apart the crime genre – imbuing a cheap paperback with artistic innovation and littering it with pop culture touchstones; Une Femme Est Une Femme subverts the tropes and values of American romantic musicals; the arguable jewel in the crown is the dizzying lay metatextual Le Mépris, a odyssey into a wavering marriage drawn from epic poetry and claustophobic psychodrama. Pierrot Le Fou melds recognisable elements into the most overtly political of the films, with its sites set more of Vietnam than typical plot beats; Alphaville is grungy future-noir abstracting popular fiction into hard-boiled monochrome philosophy. Truffaut famously claimed that there is cinema before Godard and cinema after him – this collection is an introduction, or a reminder, of why.